Here are some pictures of Rafael Nadal, the unofficial world no.1 player in the world for you. 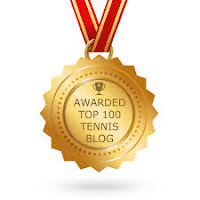 As you know, Nadal has already arrived in Beijing, chasing his first Olympic gold medal. 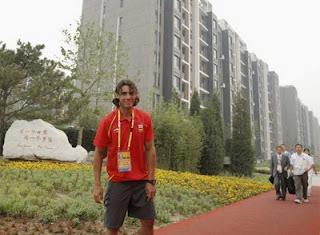 Rafael Nadal was spotted in Beijing Olympic village talking to other Spanish sportsmen. 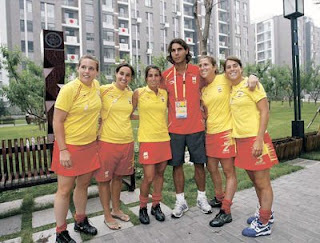 Here he posed with Spain's female hockey players. He is obviously in a good vibe with smile and confidence on his face. Also with him is fellow Spaniard tennis player, Tommy Robredo. He was also seen practicing on the court, and showing off some ball balancing skill.